...I dreamt of my mother. I admit that I seldom dream about her ever since she was gone. But when I do, my dreams seem to be very vivid, very real. In this particular dream, I saw myself with some relatives and friends. As I had really had been planning, in my dream, I had organized a small intimate party to remember my mother's birthday. My tito and tita from the States were there plus our next-door neighbors. I also saw Zoe holding hands with a smaller girl in a cute dress (which is I think supposed to be our baby#2). Suddenly, as the party was about to start, I hear from the folks that my very own Nanay was there standing infront of our house. So I rushed to embrace her as the other people looked on. I hugged her tightly and kissed her many times on the cheek. She was wearing her brown and flesh blouse and pants set. She didn't say anything. She just stood her as I kept saying "I love you Nanay" and "Don't let go!". In my mind, I thought that if I let go of my embrace, she will disappear. I was feeling her energy slowly fading and that she was drifting away. Then suddenly, I wake up. It was morning. The next day (February 1) was her birthday. She would have been 62 years old. We woke up early that day to go to mass. 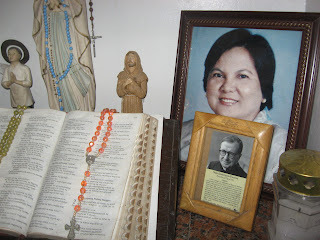 We offered mass for her soul as well as for my grandparents and uncle whose birthdays also fall in the month of February. After mass, we headed to the cemetery to visit her. Silently, I said 'hello', 'happy birthday' and 'thank you'. You see, the last time we visited her was on Christmas Day. Hubby and I particularly asked her to intercede so that we will have another baby soon. She answered our prayer by New Year's. Galing noh? We prepared a simple lunch that day. We had spaghetti, fried chicken, grilled bangus, lumpiang shanghai, and barbeque. My tito (my mother's brother) and his family plus other close friends of my parents arrived to celebrate with us. Of course, my Tatay was there too. It was great to remember her that way. By the way, here is the yummy cake which we ordered from Estrel's. I asked them to put violet and pink flowers on the cake (since my Nanay's name is Violeta and violet is her birthstone color). In the afternoon, I was particularly touched because I got a call from Mrs. Picadizzo, a co-teacher of my mother. She said that she just wanted to greet my mother happy birthday. With her was one of the 'alagas' of my Nanay in the school where they used to teach. This boy (nicknamed Erap) also talked to me on the phone and told me that he wished he could go visit my Nanay's grave that day. He added that for him, my Nanay is the best teacher ever and that he is sure that my Nanay is very happy with God because she was very mabait to him and to many people. I said thank you to both of them for remembering even if my Nanay has been gone for almost 4years already. Grabe talaga my Nanay. She's really something. 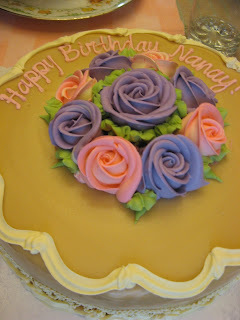 Happy birthday dear Nanay! I love you. I hope I make you proud. Sis, na teary eyed ako sa entry mong to. Heheh! your mom is really something. She is looking at you in heaven and I guess that little girl u saw in ur dream with Zoe is ur second baby. I dreamed of my little girl too with Izabela. Sobra talaga ka sis..prayers do wonders talaga. and ur mom keeps on whispering to big J in heaven talaga to help u out. Ingat ka.